- see also special section on Japanese FDI in Canada www.witiger.com/internationalbusiness/JPNFDI.htm . INTRODUCTION The ability to attract Foreign Direct Investment is a validation of international opinion on the attractiveness of an economy. If you cannot successfully attract FDI then it is bad because you will miss out on developments in the technological environment and you will suffer in a competitive economic environment. The Dept. of Foreign Affairs exist mostly to help Canadian companies export, Industry Canada has sub-departments that work on attracting investment in to Canada. Provincial governments and large municipalities also work at attracting foreign investment into their territory because of the belief that the investment will increase job opportunities and increase the corporate tax base. 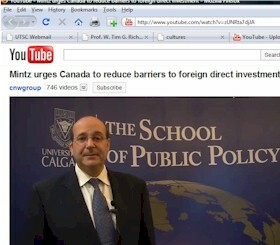 discusses points about foreign direct investment in to Canada. Mintz argues that Canada is not in danger of being bought out by too many large foreign companies and makes a point that Canada is in turn doing a lot of the FDI overseas. "Canada puts no restrictions on the repatriation of capital or profit by foreign investors - one of the reasons the country attracts a high level of foreign investment." "Canadian industry is not being bought out by foreign buyers and Canada's competition policy is working well, federal Industry Minister Jim Prentice told the Vancouver Board of Trade on Tuesday. But the government will "carefully consider the creation of an explicit national security test that will be applied to foreign investment" and "examine the need for guidelines on takeovers by state-owned enterprises," Prentice said. - the story line in Sept 2007 when the newspaper described how U.S. auto-parts maker ArvinMeritor Inc. arvinmeritor.com was shutting down a 500 employee Toronto plant and shifting the work to Mexico. 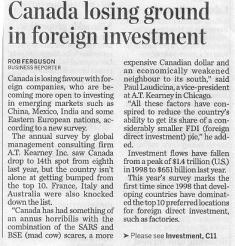 One of the reasons why Canadians want to ATTRACT FDI is to attract the jobs that are associated with such investments - and when the investment turns out to be too expensive to continue, the foreign company may withdraw, and many Canadians will be left unemployed. ArvinMeritor, which makes shock absorbers, said on their website "The company must operate from a global manufacturing footprint that optimizes capacity and reduces costs"
Employee cuts by auto parts makers follows trends in te economic environment in North America which has seen the BIG 3 auto makers cut tens of thousands of jobs in recent years to deal with falling sales and the consequence of consumers shift to Asian cars. 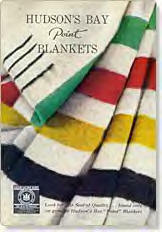 When I (Tim Richardson) was a small child, my mother had a Hudson's Bay blanket draped across the bottom of my parent's bed. She showed me the black marks that indicated how many beaver belts it was worth and told me of the great company that spanned Canada from sea to sea to sea. For my father (Prof. George Richardson), who was born in Western Canada, trips to the local "Bay" store were an important part of sourcing provisions of all kinds in the 1940's and 1950's. My grandfather and great-grandfather shopped at the Hudson Bay Stores in Manitoba in the 1800's. "...at one point the Hudson's Bay Company owned most of Canada, and it was only after Confederation in 1867 that negotiations were undertaken with the goal of transferring ownership of lands west of Kenora, Ont., to the government of Canada." In January 2006, American billionaire Jerry Zucker finally put together a large enough offer that the Bay's board of directors agreed to sell the company. This is somewhat sad since many of the other large Canadian companies like Eatons and the Canadian Pacific Railway hotels are also sold off foreigners. In the 4th week of January 2006 the story of the Bay being sold got a lot of press in the newspapers. Why would an American want the Bay? Well, it has 100 Bay department stores and 290 Zellers discount all in prime areas of real estate in all the large and medium sized Canadian cities - that in itself is quite valuable. 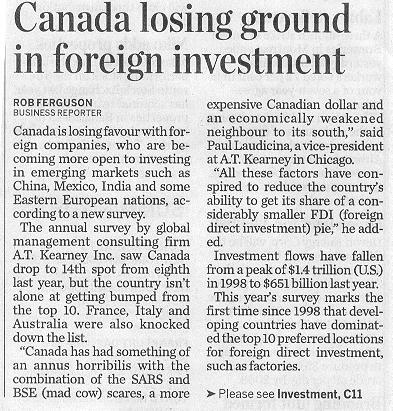 Some people think this situation of foreign FDI in Canada is bad for Canada and they note that Dominion Bond Rating Service, which kept HBC "under review with negative implications," reiterating concern that Zucker, who is paying $1.06 billion to buy the company might gut the retailer of its real-estate assets which have an estimated value of between $700 million and $900 million. gasp Mark Anderson wrote in The Ottawa Citizen "..one of HBC's last -- and many observers felt best -- moves as a Canadian company was to spend $100 million to wrest the Olympic clothing contract away from Roots Canada, whose distinctive team beret was the fashion hit of the 1988 winter games in Nagano, Japan. Indeed, so popular was the Roots uniform that several other countries contracted the Canadian company to make their uniforms for next month's Winter Olympics. The result is that Canadian athletes will parade into Turin wearing clothes by American-owned HBC, while U.S. Olympians will sport outfits designed by Canada's Roots." Hudson's Bay Many Canadians of Scotch-Irish and French heritage are familiar with this historic company and many know the letters on the company sign that proclaim the founding in 1670. Some marketing experts think that new Canadians from Asia and the Caribbean would think of HBC as just another dept. store - only more expensive than Wal-Mart. 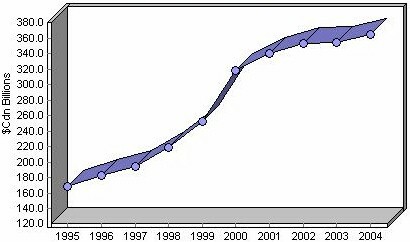 Hudson's Bay suffered the consequences of a very very intense competitive market and the "fame" of its brand has not (in the 1990's and early years of Y2K) been powerful enough to capture new customers from a population in the large cities who shop based on low price. The Canadian Pacific Railway has been considered by some to be the largest engineering project * in the world, even larger than the Great Wall of China or the Pyramids of Egypt. When the CPR was being built across Canada the government gave land to the CPR company and on this land the CPR built many elaborate hotels and resorts - some of which became famous Canadian landmarks. CP Hotels grew and expanded. "It acquired the renowned CN hotel chain in 1988, which brought the distinguished Chateau Laurier in Ottawa and Jasper Park Lodge in Alberta to the CP collection. This acquisition also crowned Canadian Pacific Hotels the largest owner-operated hotel company in the country, with hotels located from Victoria, B.C., to St. John's, Newfoundland. The organization's next step was to move outside of Canada with the purchase of the sun-destination Princess Hotels, situated in Mexico, Arizona, Bermuda and Barbados, in 1998. Motivated to expand globally, Canadian Pacific Hotels acquired [U.S. based] Fairmont Hotels in the fall of 1999, creating Fairmont Hotels & Resorts." In January 2006, Fairmont (CP Hotels) sold out for $3.8 billion to Saudi Prince Alwaleed bin Talal bin Abdulaziz Alsaud - listed by Forbes magazine as the 5th richest person in the world. In December 2002, Al-Waleed donated $27 million to a Saudi Government telethon raising money for the families of Palestinian suicide bombers - interesting because he maintains a pro-American stance and in 2005 donated $20 million each to both Harvard University and Georgetown University! Alcan - (which was simply an abbreviation of Alumnium Canada), was on of the largest Canadian mining and metal fabrication companies in Canada - up until May 2007 when the giant American company Alcoa - (which is an abbreviation of Aluminium company of america) expressed interest in taking it over. shareholders, Alcan's Board of Directors will consider the proposal..."
What does a Alcan-Alcoa merger mean for Canadians? "A merger of Alcan Inc. and Alcoa Inc. would create a new company with headquarters shared between Montreal and New York, Alcoa Inc. ALCOA CEO Alain Belda said Monday, adding that he would split his time at both locations. “We will center our primary business in Montreal,” he said in an interview on the company’s Web site. Mr. Belda said the Canadian division will be the largest company in Canada with about US$32-billion in sales. He also plans for Canada to be the centre for the company’s research and development business." The key point is that Canada appears to be losing favour with foreign companies who are more interested in emerging markets in China, Mexico and India. If you check the www.atkearney.com site you can read parts of the report titled "Foreign Direct Investment Confidence Index, September 2003"
"WASHINGTON, D.C. (September 17, 2003) — China has widened its lead over the U.S. and other investment destinations worldwide as the most preferred location for foreign direct investment, according to the latest Foreign Direct Investment Confidence Index®, based on an annual survey of executives from the world's largest companies conducted by global management consulting firm A.T. Kearney. Global executives indicated a greater future likelihood to invest in emerging markets than in industrialized countries. For the first time since 1998, a majority of the top 10 destinations most attractive to corporate investors are emerging markets, including China, Mexico, Poland, India, Russia and Brazil. Emerging markets were rated most attractive for offshoring IT and business processes and also for first-time investments. Four developed markets — France, Italy, Canada and Australia — dropped out of the top 10 most attractive FDI destinations this year."